After an annual mammogram showed abnormalities, I had a biopsy on July 7, 2011. I was diagnosed with Invasive Ductal Carcinoma (IDC), left breast tumor, ER+, PR+, Her 2- (hormone-positive, herceptin-negative) breast cancer. Over the next few weeks, I had an ultrasound, an MRI and a PET/CT scan. A lesion was found on my spine and a small nodule in my lungs. After a biopsy of my vertebrae was done, I was diagnosed with Stage IV (metastatic) breast cancer from the start. I began treatment in August, 2011, with a daily anti hormonal pill and monthly injections. Unfortunately, I had a terrible reaction to this medication, so I was changed to monthly injections of a different anti hormonal after a few months. I quickly learned that metastatic breast cancer is a terminal diagnosis, but that the cancer can be treated to slow down its progression. To hear that my lifespan would be drastically shortened (the average at that time was three years), was very difficult for me. I felt such loss, isolation, and anxiety. These emotional challenges, along with the side effects of medication, and the physical pain of the cancer were overwhelming. My family and church were caring and supportive, but I still felt a great need to connect with others who were struggling with the same concerns. I became aware of the Delaware Breast Cancer Coalition not long after my diagnosis. They offered to connect me with a peer mentor. When there were concerns or questions, I knew I could call and talk with someone. Later, I was happy to be trained as a Peer Mentor. They have provided me with a way to encourage other women diagnosed with metastatic breast cancer. They also provide an annual conference I have attended, and periodic outdoor events to uplift the spirit. Seeing what they do has helped motivate me to become active in learning, advocating and serving in the national metastatic breast cancer community. Every day I am thankful to still be alive, and to have the opportunity to make a difference in someone else’s life. In July of 2015, I sneezed while brushing my teeth and doubled over in pain. Testing revealed metastatic breast cancer in multiple areas as well as separate thyroid cancer, that was surgically removed. I started a treatment regimen of three monthly injections and continued with good success until December of 2016 when a PET scan revealed additional spots on my bones, growing spots in the lungs and new mets in the liver. Treatment changed to chemo pills plus a monthly injection and continues. As of May, my cancer, although still present, was essentially inactive. Shortly after my journey began, I discovered meditation. I try to live in the moment with an attitude of gratitude. “Life isn’t about waiting for the storm to pass it’s about learning to dance in the rain.” Since having cancer, I have walked on the Great Wall of China, witnessed a spectacular volcanic eruption in Hawaii and ridden an Alaskan dogsled. My faith has strengthened; my diet improved; and I more fully appreciate family and friends. Cancer was definitely not a diagnosis I ever wanted to hear, but I can honestly say there is indeed, “life with cancer” and a good one at that. DBCC ‘s varied programs have been so beneficial, especially my favorite, Nurture with Nature, a series of outings—canoeing, kayaking, hiking, birdwatching—a form of relaxation and renewal of spirit in the company of fellow survivors. The outreach accomplished by such a dedicated few DBCC employees is unsurpassed. My journey has been blessed by them, by family and friends, and most definitely by God. Life is good. In July of 2002, at the age of 43, I heard the dreaded words “ You have stage IV breast cancer with bone mets”. My life was forever changed. I knew right then I had to make a choice. I could either take the road to the left which was doubt and fear or I could take the road to the right which was faith, hope and love. So I set out on my breast cancer journey. I have been in continuous active treatment since being diagnosed 15 years ago. I’ve dealt with chemotherapies, radiation therapies, hormonal therapies, breast surgeries and numerous surgeries on my femur which resulted in a hip replacement in 2015. The journey has been rocky, uncertain and with definite ups and downs. But through it all, I have tried to remain positive and hopeful. In 2008, I met Lois Wilkinson with the Delaware Breast Cancer Coalition. I signed up to volunteer to be on the committee for the Southern Lights of Life. She asked me that year to be a model at the events fashion show. That began a friendship that opened up opportunities for me to volunteer at their fundraisers, health fairs and to also participate with the Nurture with Nature program. Being a peer mentor I feel I have given other “warriors” like myself more than just an ear but a gift of friendship. Spreading faith, hope and love may be the difference between someone merely surviving or thriving. It has been 14 years now, I have somewhat defied the odds. It has been a hard road and I have lost a few too many friends along the way. I’ve seen some positive changes and advances and there are more of us living longer than 10 years than ever before. More advocacy groups and research are needed so others won’t have to go through what we metastatic survivors have had to endure. I will continue to fight and take control of my own life by choosing healthy lifestyle habits, continue with mind/body practice and nurturing supportive relationships with my family and friends to quiet the stormy seas in my mind. Ultimately, my purpose is to thrive, find joy and contentment amidst and in spite of this unwanted disease. My goal is to stick around as long as I can, adjusting my sails along the way. I’m so very grateful that back in July of 2002, I choose to take the right road . . . faith, hope and love. I was first diagnosed with breast cancer at the age of 31. My daughter was 3 years old and my son was 6 months. I had a double mastectomy, 6 rounds of chemotherapy, and 31 treatments of chest wall radiation. In August 2015, I was diagnosed with a recurrence of breast cancer that had metastasized to my liver, lungs, bones, and brain. But I am a fighter and I tried not to let this bring me or my family down! I am fortunate to have a wonderful network of family members, friends, and coworkers who provide me with love and care. But I also rely on the support of the Delaware Breast Cancer Coalition. DBCC was the best way for me to get information and help. Lois Wilkinson is awesome and has been by my side through all of my treatments. Their Peer Mentor Program is great for people who have been diagnosed! It was a great help for me and answered so many questions when I was first diagnosed. There were so many terms and words that I didn’t understand. Being a single mother can be financially challenging sometimes. We also received an amazing Thanksgiving meal, all thanks to the DBCC. For me, being a Survivor was a short lived experience. It was such a special day when I was told I was good to go! What a relief!! There are many ups and downs during treatment but the key is to never give up and never be afraid to ask for help. Now that I’m going through this for the second time, I consider myself a true Cancer Warrior. Since my cancer has metastasized, I will be on maintenance chemo for the rest of my life. I would like people to know that it’s okay to ask how I’m feeling or how I’m holding up. I have good days and bad days . . . sometimes I just need a big hug! Some days I want to talk about it, some days I want to ignore the fact that I have to pretend I’m living a normal life. But it’s always okay to ask. I would encourage everyone to support the DBCC. They help women of all ages who are coping with trying to beat this nasty beast, whether it be emotionally, financially, or medically. I am a Jersey Girl who moved to Delaware 8 years ago. I had been healthy all my life with no medical history. In 2012 I went for a routine mammogram. After the mammogram they asked me to stay for an ultrasound. That was the start of my new journey into a world I knew nothing about. The next day I got a call from my general practitioner and was set up to see a breast surgeon. After numerous appointments and a biopsy I was told I had stage 4 breast cancer. Stage 4 or Metastatic cancer is different. Most people don’t understand or know what it is. Metastatic cancer is cancer that spreads to other areas. Unlike other stages of cancer it is not curable but it is controllable. It also means that treatment will never end. This is harder to accept and live with. Most Metastatic cancer patients have anxiety and a hard time trying not to think about it all the time. Other cancer survivors sometimes are uncomfortable around us. We can sometimes feel out of place. We are all hanging in praying for a cure or new treatment to be found before it is too late for us. I met my oncologist who started a plan for me. While at the office I saw a brochure for the Delaware Breast Cancer Coalition. I decided to stop by the DBCC office the next day. I met Lois Wilkinson who runs the Dover office. Lois made me so welcome, listened to my story and gave me hope. For five years now she has held my hand, listened to me day or night. Lois also set me up with a wonderful caring mentor Marie Carey who has the same cancer as I have. Through DBCC I have met many wonderful people, enjoyed get togethers, fundraisers and being apart of something special. I have gone through a mastectomy, radiation, back surgery, had my ovaries removed. I am on shots to keep the cancer from spreading more. I truly believe that I was meant to be here. My team, Dr. Wendy Newell my breast surgeon, Dr. Rishi Sawhney my oncologist, and the DBCC have saved my life. I am truly blessed and continue my journey. March 2011, I heard the words no one wants to hear, “You have breast cancer and it is Stage 3.” My only thought was, “Why me?” I had worked hard and improved my health two years prior. I wanted my Mom (she had passed away less than a year before). I was a single parent, how would I tell my son? I was mad, scared, and shocked all at the same time but I picked myself up and decided that I had come this far and wasn’t going to let cancer take over my life. I was going to be there to see my son graduate from high school, get married, and have kids, I wanted to be a grandmom. I knew it wasn’t going to be easy but I knew I was stronger than this disease. Shortly after, I had a bi-lateral (double) mastectomy. My treatment plan was chemo every 3 weeks for a year and 6 weeks of radiation. Two years later I signed up for Peer Mentoring Training with the Delaware Breast Cancer Coalition. At the training, I met Lois Wilkinson who has become a great friend and support system. I was cancer free as I watched my son graduate high school in June 2014. I stayed in remission until July 2015. A pet scan showed that my cancer had spread to my lungs. My new diagnosis was Stage IV Metastatic Cancer. I have stayed positive and optimistic since having cancer the first time and knowing that there has been much advancement in cancer treatments, I wasn’t as scared. I started chemo again in August 2015. My scan in November 2016 showed that the cancer had spread to my neck, chest, and spine. My chemo was modified and I continued chemo every 3 weeks. In March of this year I went back to work part-time. The scan I had in March revealed the spot in my neck and one of the spots on my spine were gone; however, the spots in my lung had grown. My doctors changed my chemo program again and I continued my treatment. I continue to remain positive and optimistic. I’m very grateful and thankful for the advancements that are continuously being made in cancer treatment. I have a wonderful daughter-in-law and am excited to say I will become a grandmom in December! My name is Dominique Barbabey. I am 26 years old and I have Stage 4 Breast Cancer. I first found out at age 22. The cancer was already in my liver and left breast surgery was out of the question. But my oncologist told me that chemotherapy was something I needed to start, changing my eating habits and finding support was recommended. THIS was the most emotional and life changing experience I have ever been through. I have two beautiful little girls Saywonza age 7 and Jada is 4. At first I couldn’t understand why. I came across a loving, caring, determined and strong woman by the name of Lois who works with the breast cancer coalition and my life began to show light. Being young and having children, your mind races with so many thoughts and questions. But Lois and her team helped me so many times. Christmas time she helped me with Tanger outlets trees of hope program so my princesses were blessed with Christmas gifts. The breast cancer coalition helped me with gift cards for food, clothes for my daughters, a cellphone to keep in contact with all of my doctors, I was blessed to also receive Thanksgiving meals and beautiful fruit baskets. They also helped me with resources to help pay my bills. The list of support they give me is so unlimited. I am strong and I am loved by them so much that I just thank God for calling Lois four years ago. The Delaware Breast Cancer Coalition also referred me to a mentor and her name was Lori and Lori changed my life. She gave me hope strength, courage and love. Her words were always positive as was her support. She is so strong and being around her made me want to push, fight and make somebody my age believe that there is a chance and there is hope. And with the love of God I believe one day I will be able to say I BEAT CANCER! This issue we were blessed to have our photoshoot for our Kent County magazine at the beautiful Fifer Orchard and Country Store, which is located at 1919 Allabands Mill Road, Camden-Wyoming in Delaware. For full details on this wonderful business go to their web site fiferorchards.com or you can also call them at (302) 697-2141. This is a destination trip well worth traveling to. Not only are the vegetables and fruits the best in the state, their service is amazing. With farming decreasing every year across the U.S., it is such a beautiful thing to see what this family farm, that started in 1919 by Charles Frederick Fifer, has grown into. Not only are they still growing, they are also maintaining the high standards that started in 1919. 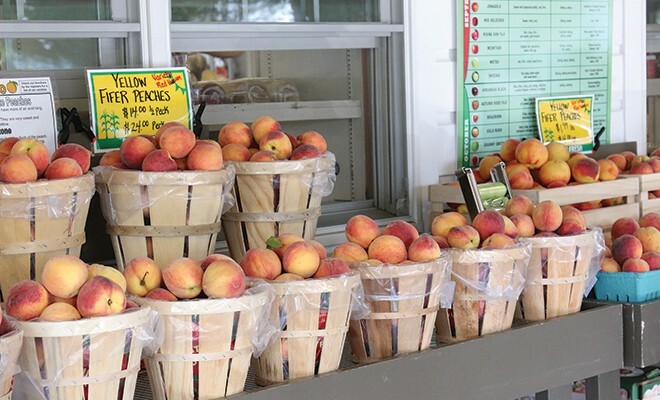 The Country Store is open from April-December each year and features a constantly changing mix of seasonal, homegrown fruits and vegetables. We would like to thank the owners and management of Fifer Orchards, located at 1919 Allabands Mill Road, Camden-Wyoming, Delaware for hosting our photoshoot at their beautiful location. You can contact them at (302) 697-2141. I would also like to extend a huge thanks to Mike Baker owner of C.M. Baker Photography for photographing all of our attendees. None of our shoots would be possible without our partnership with Mike. If you are looking for a professional photographer and all around great person to work with, call Mike at 302-335-1500 or 302-242-6643. 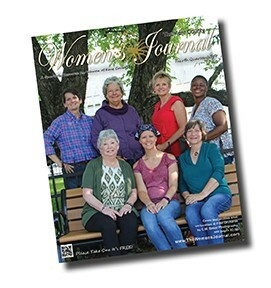 We were honored to have our seven brave breast cancer survivors participant in our photoshoot, and I hope that you will let them know that you appreciate that they shared their stories in the Women’s Journal. Complete profiles on each of our participants can be found on Pages 27-30.